The visual or picture dictionary ‘Looking Learning’ was born out of the sheer necessity to create a language learning tool which is ‘outside the square’ in its formulation. On first appearances it may appear to be yet another picture dictionary but very quickly and on closer examination its extensive word list, excellent full-size meaning-specific images, words accessible in multiple suffix/prefix forms, and the ‘picture sentence’ function place it into a resource sphere all on its own. It also very importantly has the full range of words – nouns, verbs, adjectives, adverbs, prepositions, pronouns and conjunctions. It has been developed to teach English fast to ESL students, to assist vocabulary acquisition in any young learner and to offer a valuable resource to those students with language difficulties due to a language disorder/impairment. By experimentation it was discovered that the English language could be learnt very effectively through presentation of appropriate images. A carefully selected picture was found able to convey a complex understanding of a word with very few written words involved in the teaching process. Many visual dictionaries are limited in both vocabulary and also in their ability to convey clear word meaning. ‘A picture is worth a thousand words’ is actually very true if the picture is the correct one. ‘Looking Learning’ pictures are unique in that they have been developed over 10 years with full focus dedicated to successfully visually describe words to their fullest meanings. No shortcuts have been taken. This is a real game-changer in language learning. 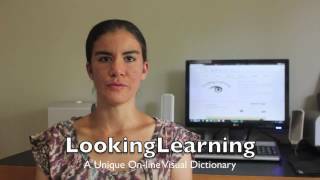 This visual dictionary ‘Looking Learning’ was developed over a 10 year period in response to a personal family challenge –a daughter born with a language disorder. When all language resources bought/tried and then failed to overcome her hurdles in language development, the natural progression was to create our own resource. With little language acquired by age 5, our daughter entered school and from there her years of frustration and anxiety escalated. By age 12, with the usual visual props used in the school curriculum rapidly dwindling, the situation became very worrisome. Our daughter struggled to learn through listening and reading written words. Another pathway had to be found. Our daughter is now 23. With the help of ‘Looking Learning’ in its formative, work-in-progress stages, she now has wonderful spoken language skills, reads prolifically and her written language is progressing consistently. It was discovered during the development of the visual dictionary ‘ Looking Learning’ that approximately 7000 English words, encompassing all word types, were required to function well in the world of the English language. Less than this reduced comprehension and communication ability significantly and also delayed the acquisition of knowledge. The visual dictionary ‘Looking Learning’ has at the moment a library of over 7000 word pages plus over 9600 suffix additions. I urge you to try this resource and help yourself, or someone in your care or responsibility, to learn English quickly and enjoyably. 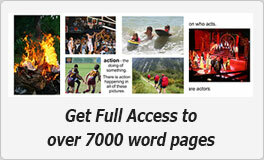 ‘Think outside the square’ and look to learn in more ways than one- over 7000 actually!